Dismantlers of white supremacy have stationed themselves in Washington to demand moral leadership from political leaders on upholding and furthering racial justice and equality. 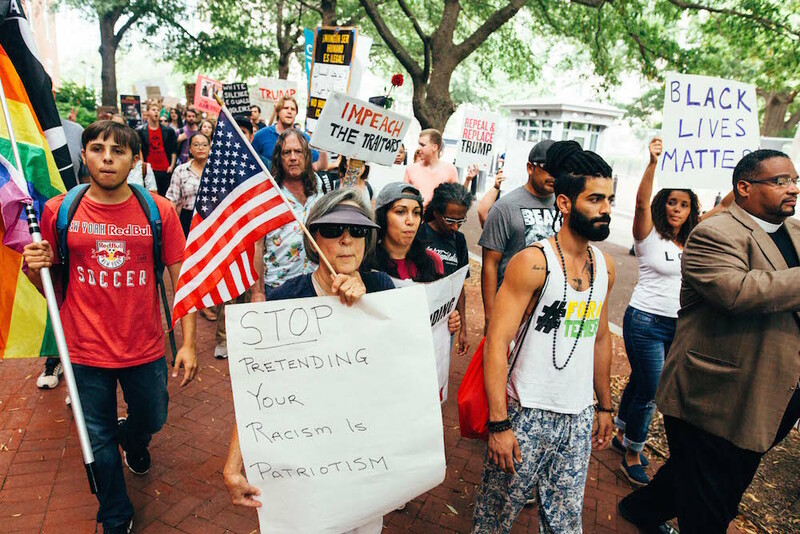 “Impeachment Square,” formerly known as Farragut but renamed since its reclamation by a group of activists who marched 110 miles from Charlottesville to Washington, is now a home and a headquarters to the fight for racial justice and the resistance of Donald Trump and his racist agenda. Accomplices who joined in D.C. and those who arrived from Charlottesville can be found there singing protest songs and chants. On Saturday, as Trump supporters descended on the National Mall to show their support of Trump, they marched to the White House. We are calling for the removal from government of all those who side with white supremacy — including the president. Once outside, the leader of the march from Charlottesville to Washington Nelini Stamp spoke to marchers and tourists explaining why we’re here and why we’re fighting. Let’s learn from their principles of unity (below), amplify their voices, be accomplices when we can, and remember that white folks—myself included—cannot lead the dismantling of white supremacy, though it is our responsibility to aid and abet in destroying it.